Learn how to nurture a fussy eater one bite at a time. Bahee is based at one of the world’s leading children’s hospitals and offers premium one to one nutrition consulting services. If you are looking for dinner ideas for picky eaters, then this king prawn rice for a fussy eater is perfect. It’s naturally gluten free, wheat free, egg free, soy free and of course milk and dairy free. If your child doesn’t need an egg-free diet, then don’t hesitate to throw it in. Eggs can be useful for increasing the protein value of recipes for your fussy eater. You can also mix up the vegetables in this recipe, you could try sweetcorn, spring onions, red or yellow bell peppers/capsicum, mushrooms or even chickpeas and lentils to reap the benefits from plant proteins. This popular recipe is basically a one pot dish so it’s quick and easy for nannies and busy parents to prepare after work. Did you know that this popular king prawn rice can be whipped up and ready on the table within 30 minutes? You could even prepare some of the ingredients the evening before so that you can get started straight away. If you are short on time, you can use white Basmati rice which cooks in 15 minutes. If you are worried about introducing prawns to little people, remember that early introduction of high allergenic foods is actually beneficial. You can read more about that here in this article: When To Start Weaning High Allergenic Foods. If you have babies under 12 months of age in the house, then a no added salt diet is necessary. Rather than preparing a separate meal for your baby, skip the stock and use fresh herbs such as coriander and dill to flavour the dish. I didn’t have any at home or they definietely would have gone in. Bring a pan of water to boil then cook the basmati rice until half cooked. Drain excess water and set aside. If using frozen peas, you could also add these to the pan five minutes before the rice is cooked. Whilst the rice is cooking, heat the vegetable oil in a saucepan and saute the onions, garlic and frozen Thai mix. Next, add in the tomatoes, frying a little before adding in the stock and rice. Cook until the stock is fully absorbed by the rice. Finally, mix in the peas, baby spinach and king prawns. Dish out to hungry bellies. 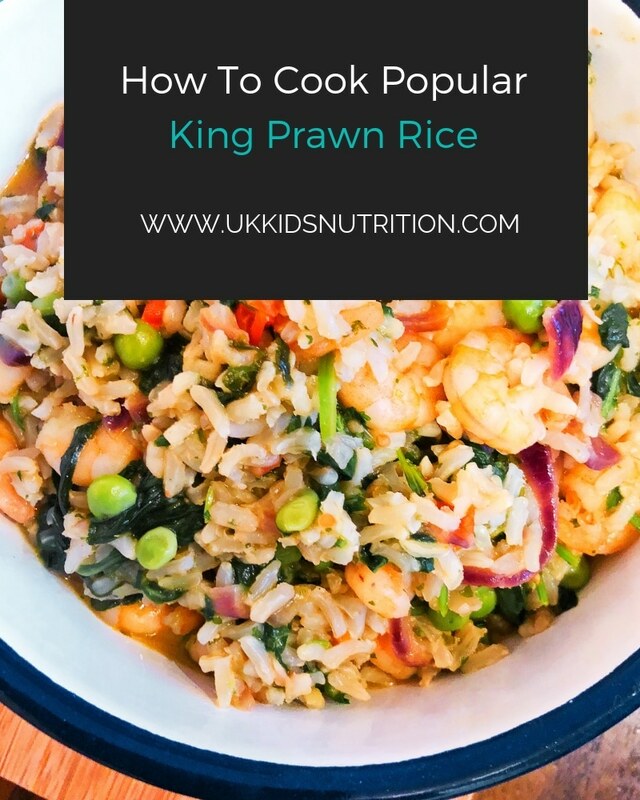 I’m pleased to report that this king prawn rice for a fussy eater is a favourite amongst both my toddlers. This popular recipe gets a star rating of FIVE BANANAS as determined by the enthusiasm that it was eaten, aroma as it arrived at the table and finally, the empty plates of my children. For bookings and enquiries email me on bahee.vandebor@gmail.com or book a free initial consultation here.